In some groups the musicians might be referred to as "backup"; but not Risky Business. These five guys are real band, with its own personality and even, to some degree, its own repertoire. Our musicians form the "Sixties" axis of the group and play authentic Rock 'n' Roll. But they also have extensive experience playing a variety of other styles, which gives Risky Business the versatility to play at most any function. Tommy's been with the group the longest, joining in 1992, but our musicians have a history of playing together that goes back a lot further than that. In a band with no shortage of "characters", Tommy may be the biggest one of all. He has played drums for three decades and for practically every kind of act, including a three year stay in Holland. He and his bandmates ran a dairy farm on the side, getting up at 5 AM to milk the cows. This long experience has given him a certain "seen it all before" air and there is pretty much no way to get him stressed out on a gig. In the '70s he played with a number of touring groups including a one-hit-wonder named Crazy-Elephant. Just before joining Risky Business he played for many years in a Long Island wedding band named Windjammer. 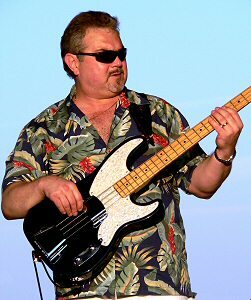 He was responsible for recruiting two other Windjammer alumni, Willie and Greg, to play bass and keys for Risky Business. Tommy's vast experience has given him a real feel for authentic sounding rhythms. Cha-Chas sound like Cha-Chas, Rock 'n' Roll like Rock 'n' Roll. The same goes for Swing, Merengue and Doo-Wop: You never feel like everything sounds like rock, or (worse) like a cocktail group. One of the better Tommy stories from the Risky Business years (he joined in 1992) was the time his car's trunk caught fire on the way to a job at Hoyt Farms Park. He pulled off onto the shoulder of the Northern State Parkway, and with the help of his daughter, rolled his smoldering drums on the grass to stop them from bursting into flames.. Meanwhile, at the park, the band was getting nervous since Greg was already there with no word from Tommy. (as some of our more observant fans may know, when Greg gets to the job, it's officially late) About 15 minutes before the job was to begin, a police car pulled up with Tommy, his daughter and his drums. Tom had somehow convinced the officer to drive him there. Moral of the story: Tommy always makes the gig. Willie has the best "chops" in the band and isn't afraid to use them. A guitarist he used to play with was of the opinion that there must be more notes on Willie's bass neck than on his guitar. Willie would agree, saying "That's why it's longer". In any other band Willie's comedy "chops" would be tops as well, but this band has Ed in it, so there's heavy competition. Nonetheless, Willie has a thousand jokes in his head and since he's been on the 'net, the number is rising every day. He and Richie, our guitarist, make up the "Astoria Connection" in the band. They have known each other and played together in one setting or another for decades. Legend has it that they met when Willie "followed his ears" to an apartment a few blocks away where Beans was practicing with the windows open. While Willie will happily bend your ear for a half-hour on the subject of basses, amps, strings or speakers, he can, unlike Richie, leave his instrument alone during breaks. Willie also sings some of the band's baritone parts and some leads. In fact, his repertoire is quite extensive as he is one of the principal lead vocalists in the band "Let's Go Crazy", a five or six piece group that occasionally surfaces in the wintertime to play Classic Rock hits. With Risky Business he sings "Black is Black", "Personality", "Long Tall Glasses" and a bunch more. With enough crowd support, he can be coaxed into singing "The Letter", "The Weight" or "Desperado". 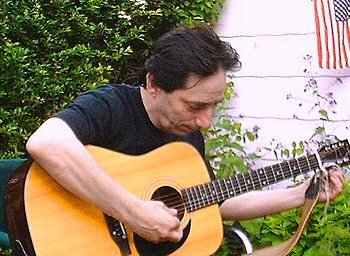 Willie joined the band in 1993 fresh from a long stint with the Long Island wedding band "Windjammer". With his '60s roots, his wedding experience and a long tour through the twisting pathways of the Risky memory vault, he can play most any style. In this band that's a real asset; we really try to mix it up.. He'd say "I've finally got it! THIS is what I've been looking for"
After three weeks or so, a few flaws would crop up. The one thing that can pry him away from his guitar for awhile at a gig is food. Although he weighs only a little more than his Strat (and probably less than his amp), he is arguably the biggest eater in the band. 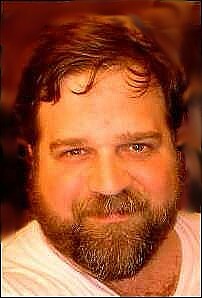 Stories abound of him making a snack of a pound of bacon, or breakfast of a whole box of Uneeda Biscuits drowned in a giant bowl of coffee and milk, with 10 sugars of course. Richie is a bona fide sixties guy, but learned to play authentic fifties guitar while a member of the Teenchords and the Devotions. He's very picky about getting authentic sounds, sometimes adding a pedal to his setup just for ONE song. While he's well known for letting it rip on solos, most people probably don't know that he knows one whole side of Abbey Road note for note. (so does Willie, and Greg can follow anything so... so...? Maybe someday. Stay tuned. Although Greg had his first piano lesson when he was six years old, he didn’t discover a real interest in music until a good bit later, and even then only after a couple of childhood friends decided that the three of them should form a band. He was 12 years old and just learning what a “D7” chord was, but the seed was planted. The members of that first trio weren't terribly accomplished on any instrument, so it didn’t matter very much who played what; Greg played guitar and bass guitar in addition to a fold-up Farfisa Combo Compact organ. By the time Greg was 15, he had joined a band whose musicians were good enough to “specialize." He has mostly stuck to keyboards since then, with a few exceptions. These include the time in the ‘70s when a couple of Greg’s bandmates borrowed a flute and cajoled him into learning to play “Do the Hustle.” And when the band needed an instant “Dinner Set” for some New Jersey clubs, Greg slid in on bass to fill out the rhythm guitarist’s “Coffee House” material. He claims he will take up bass “for real” someday, “when time permits." We’ll see. In the early ‘80s Greg’s musical pursuits were mostly confined to recording. The then-new keyboard and drum machines allowed him and a partner to put together arrangements for songwriters’ demos. 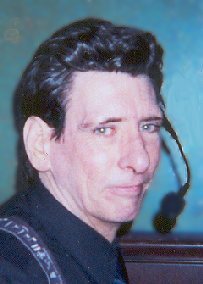 He returned to playing live after auditioning for the wedding band Windjammer -- a group that happened to include current Risky Business bandmates Marty, Willie, Tommy and Camille. That was back in 1989. Even after 24 years, Greg is still the "newcomer"; some of our musicians know each other since their teen years! Greg was the lead singer in some of his early bands, “before he met people who could sing,” to hear him tell it. But he’s become Risky’s “utility vocalist,” filling in wherever there’s a gap in the harmony, from baritone to falsetto. His “utility” role extends to keyboards as well. Thankfully, as Greg has gotten older, good equipment has gotten smaller, lighter and more versatile. So in addition to piano and organ, you’ll hear him beefing up Marty’s horn lines and filling out the arrangement with strings, accordion, timpani and sundry other sounds. Like a Swiss Army Knife in black pants. Greg likes photography also. Some of his better travel pictures can be found here . He is also the person designing this web site. So if you have comments, suggestions or perhaps a complaint about the um, leisurely pace at which things are being added, you can address them (gently) to him.